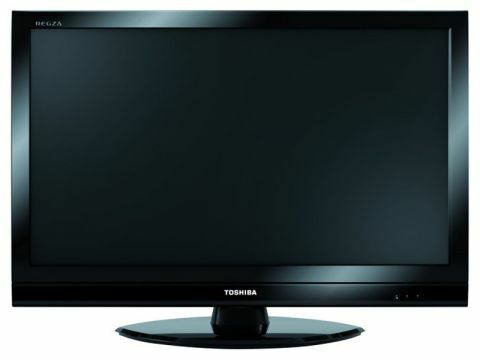 The 37RV753 is the kind of screen most people now know Toshiba for. It's aggressively priced (at the time of writing you can pick it up for £399 at Tesco Direct with a Blu-ray player thrown in free of charge) and has the design aesthetic of a dressing table mirror. It's a quantum leap away from what the brand is now trying to achieve with its WL Jacob Jensen Design studio lineup. It is a commodity product through and through, but this is not necessarily a bad thing. Viewed from the front, this RV series set doesn't disgrace itself in polite company, although some might think the glossy bezel is rather too chunky to be a la mode. So what do you get on a 37RV753? Well, not LED backlighting for a start. This model uses a traditional CCFL backlight (hence its 290mm deep cabinet), it also lacks motion resolution improvers (Active Vision M100 and Film Stabilization). In short, it's a bare bones box that offers barely any groovy gubbins.